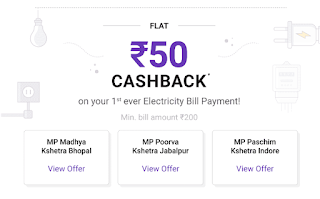 Yes there are many PhonePe upi offer on electricity bill payment september 2018, up to Rs.75 cashback on PhonePe upi offer on first electricity bill payment,up to Rs.1000 cashback on Jaipur Vidyut Vitran, up to Rs.175 cashback BSES RAJDHANI , BSES YAMUNA electricity bill payments, up to Rs.25 to 75 Gas bill payments. Offer duration : 1st September,2018 to 23rd September 2018. Eligibility Criteria: Customer will get the offer on their first ever payments Bill Payments on Phone Pe. Offer valid on all payments instruments. Minimum bill payment amount is Rs.300. Offer valid on all payments instruments except "only wallet "transactins. Offer is valid on payments made through UPI,Debit/Credit Card or (UPI+Wallet)or (Debit/Credit Card+Wallet ) payment modes. Offer duration : 1st September,2018 to 30th September 2018. 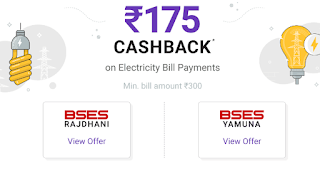 5% up to Rs.175 cashback on BSES Rajdhani / BSES Yamuna Delhi electricity Bill payment for new users on PhonePe. 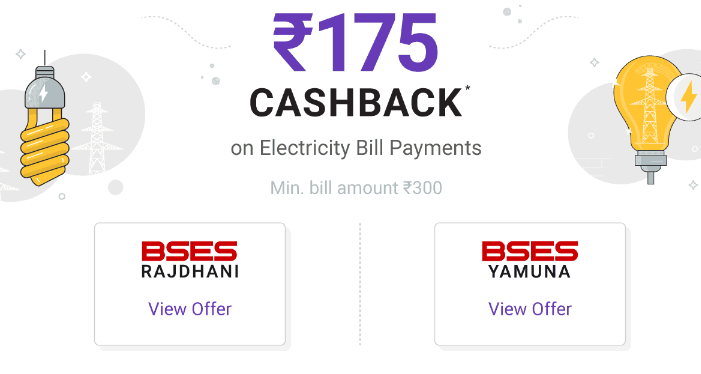 5% up to Rs.100 cashback on BSES Rajdhani / BSES Yamuna Delhi electricity Bill payment for old users on PhonePe. 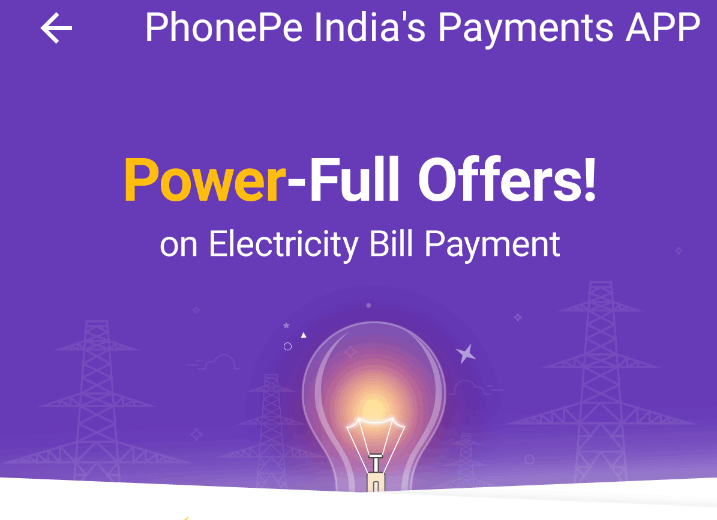 It is a good and money saver offer of phonepe electricity bill payment offers. Eligibility Criteria: Customer will get the offer on their Tata Power DDL Electricity Bill Payment on Phone Pe. Offer not valid Wallet only Payment. Offer duration : 18st August,2018 to 15th September ,2018. Eligibility Criteria:Customer will get the offer on their PUNJAB STATE POWER CORPORATION LTD. Electricity Bill Payment on Phone Pe. Minimum amount of transaction should be Rs.300. 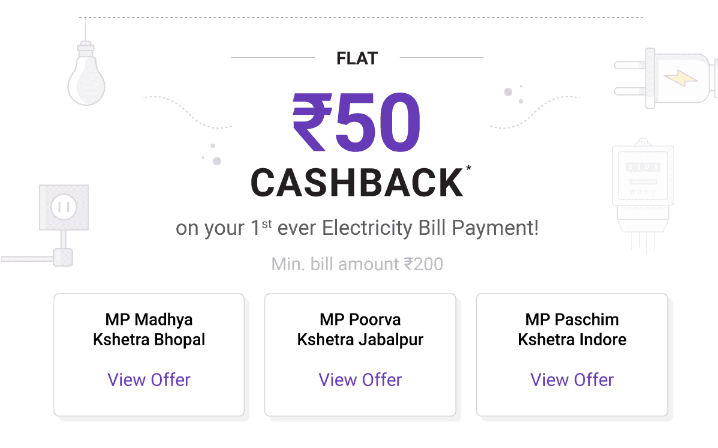 Eligibility Criteria:Customer will get the offer on their first ever MP Madhya Khestra Bhopal,MP Poorva Jabalpur,MP Paschim Khestra Electriciy Bill Payment on Phone Pe. Minimum transaction amont is Rs.200. Offer duration : 1st August,2018 to 30th September ,2018. Eligibility Criteria:Customer will get the offer on their first ever GUJRAT ELECTRICITY Electriciy Bill Payment of the electricity provider as below on Phone Pe. 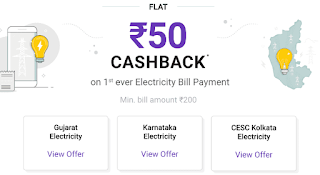 Eligibility Criteria:Customer will get the once on their first ever Karnatka Electricity Bill Payment of the electricity provider as below on PhonePe. Chamundeshwari Electricity Supply Company Corp LTD (CESCOM). Gulbarga Electricity Supply Company ltd (GESCOM). Hubli Electricity Supply Company ltd ( HESCOM). Offer valid on all payments instruments except "only wallet "transactions. 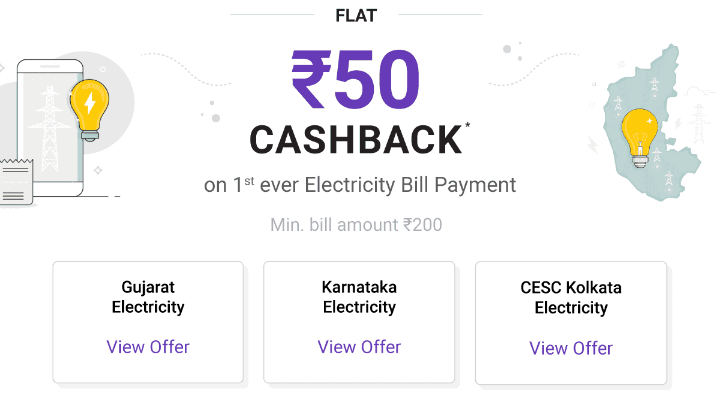 Eligibility Criteria:Customer will get the once on their first ever CESC kolkata Electricity Bill Payment On PhonePe. Conclusion: So friends these are some useful and money saver PhonePe upi offer on electricity bill payment september 2018 .I hope this information you don't ignore and take advantage of these offers if you are users of Phonepe.So go quick and Pay your electricity bill on Phonepe.